At Combots Cup yesterday Blizzard went 1-2, winning its first match against Son of Ziggy before losing to Original Sin and Mosquito. More details on the Blizzard page. Team Toad is at Combots Cup with a brand new heavyweight robot Blizzard. 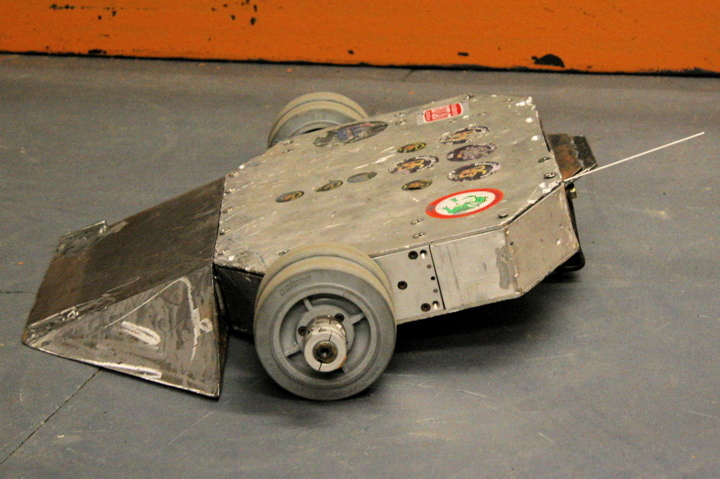 With a 40 pound steel disc spinning at 4,000 rpm, this four-wheeled robot hopes to storm through its opponents, leaving a light coating of finely-ground parts behind. We've updated our Heavyweight Avalanche page. Avalanche 2 went 2-2 at Robogames 2011, so we're building Avalanche 3 from scratch to attempt a better result at Combots Cup in October 2011. 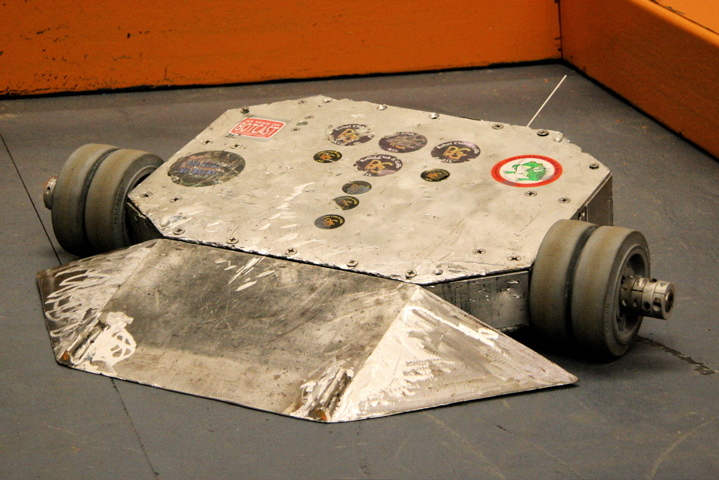 We have a web page for our newest Heavyweight Avalanche, which didn't fare so well at its debut event Combots IV. It took a week out of my life, but I bought the SPORE game and after 70 hours of play I "beat" it. Read Team Toad's review of SPORE. Ice Cube had 2 wins and 2 losses at RoboGames 2008, not as good as our last event, but at least Ice Cube was still fighting. Read all about it in our RoboGames 2008 trip report. We're proud to announce that Ice Cube went 2-0 to become the 2006 RFL MW Champion! Read all about it in our RFL 2006 Nationals Event Report. 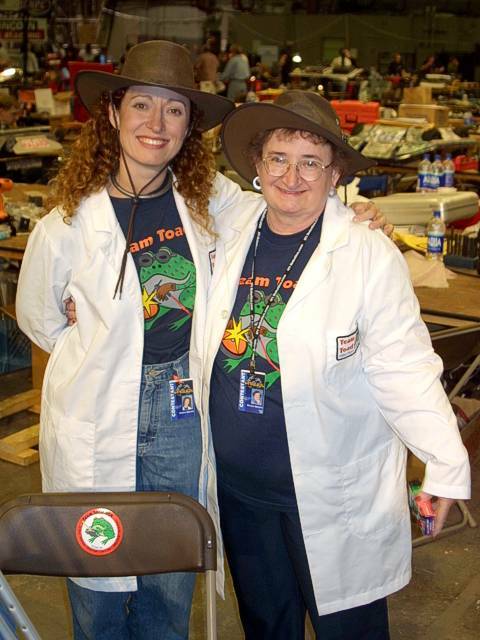 You can also go directly to our RoboGames 2006 photo gallery. 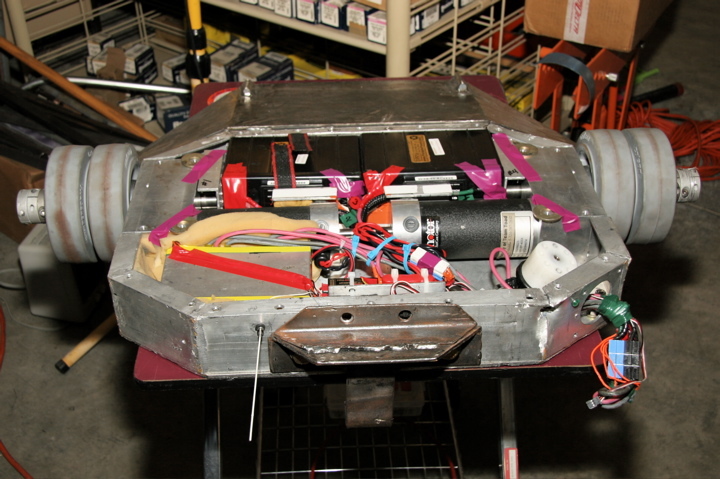 In our best showing outside of our local Pittsburgh area, Ice Cube took second place at RoboGames 2006, with a record of 6 wins, 2 losses, and 2 knockouts. 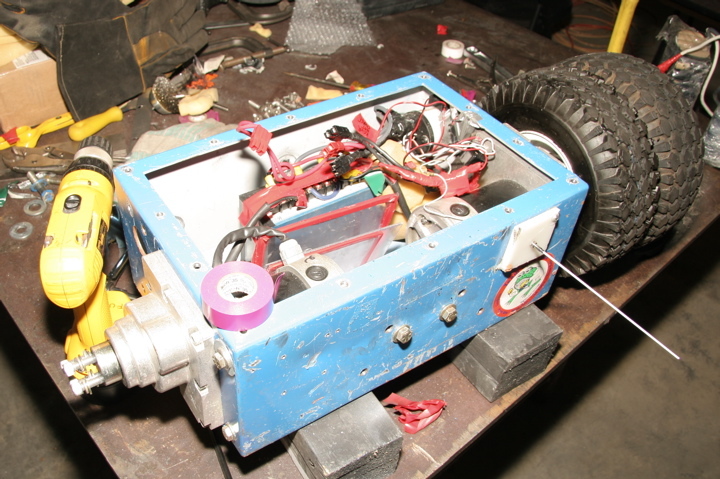 Read all about it in our RoboGames 2006 Report. We're back from Battle Beach with a 2nd and 3rd place in the Middleweights. We have the start of our BB4 trip report and our BB4 photo gallery. After a two and a half year hiatus from robot combat, we've decided to jump back into the sport this Spring at Battle Beach. Since this event coincides with Dan's custody with us, we jumped at the chance to put him back behind the controls of Lionheart, his champion middleweight. Lionheart took eighth place in the 2003 RFL Nationals with Fuzzy driving (Dan couldn't get away from school for the event). Dan's loss to Hoarf was a heartbreaker, since Lionheart lost by getting stuck under the arena walls. Lionheart had two chunks of steel on its nose to prevent getting stuck, but Hoarf managed to knock those off. Here we see Dan sharpening Lionheart's nose and you can see that we added two more chunks of steel to prevent getting stuck. In order to avoid having these knocked off, we use round chunks of steel hoping to deflect any spinning weapons. There is a four robot limit to make an event a qualifier for the RFL nationals, so when a couple of middleweights dropped out, we decided to resurrect our other middleweight, Ice Cube. Ice Cube last fought at the Robot Club, when it took third place and a thorough drubbing from Lionheart. Still, Ice Cube is our pluckiest robot with that oddly aggressive bouncing action caused by the spring steel hoop. 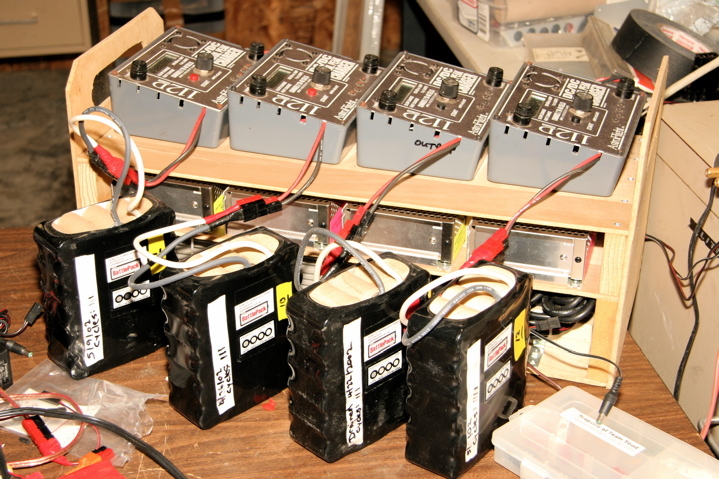 Ice Cube relies on 36 volt Battlepacks for power, so we had to load test our four year old batteries to make sure they're in fighting shape. That array of lights is not designed to attract UFO's...it's our current sink to drain batteries. 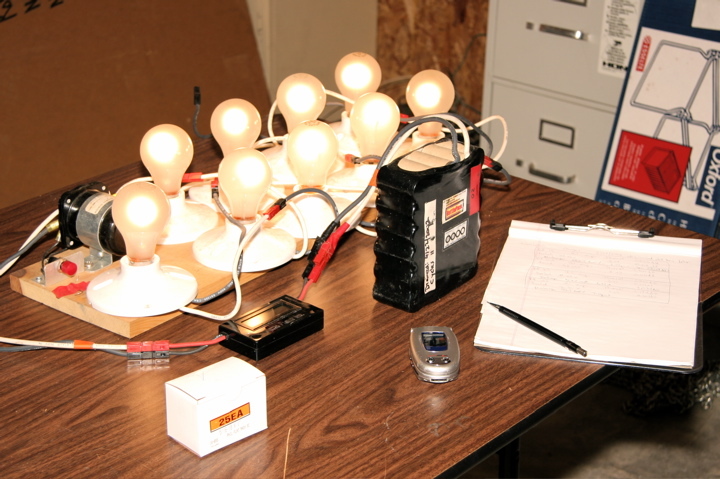 With nine 50 watt bulbs, it draws 450 watts or about 12 amps at 36 volts. Our tests indicate that our 3.6 Ahr packs are still putting out 3.1 Ahr's even after four years. Not bad! 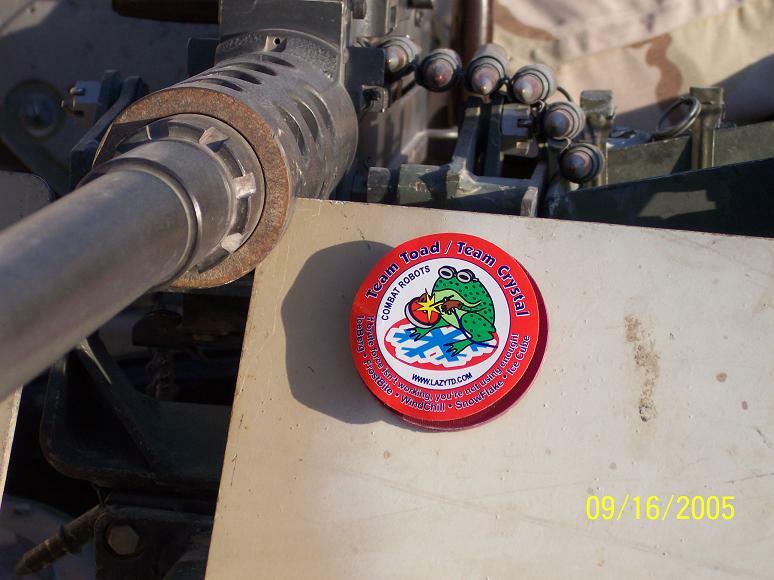 Team Toad is proud to welcome our newest honorary member, SGT Andy Vinh, who is currently serving in Iraq. 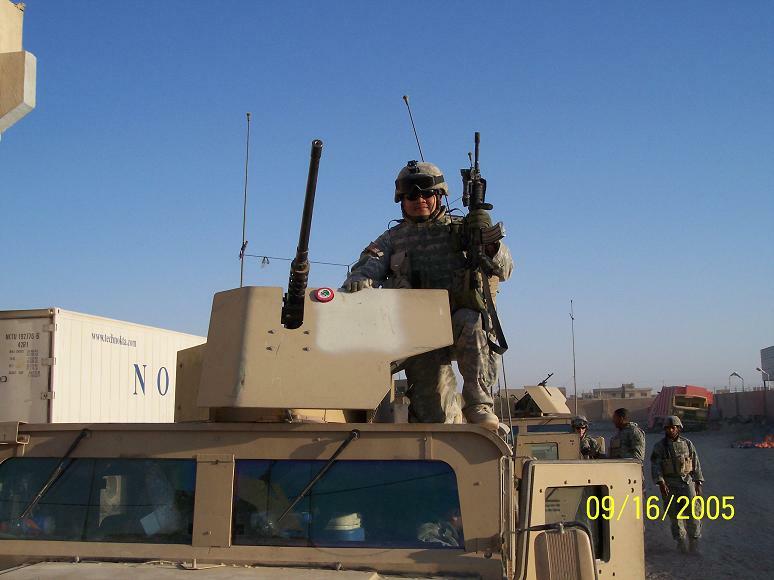 He wanted to know if he could enter his Humvee in the really really heavy weight class. I didn't have the heart to tell him about the "no projectile" rule in the Tech Regs. 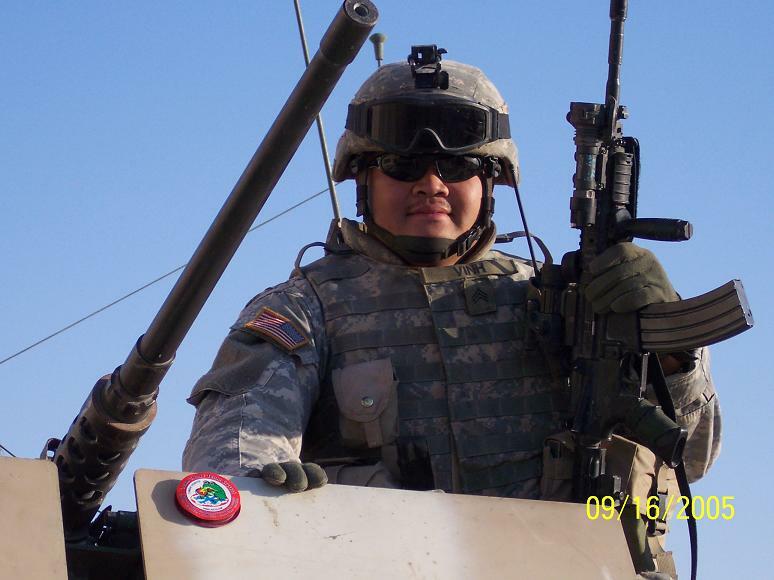 Andy, our hats are off and our hearts go out to you...we're proud to have you on the team. The new "Team Toad Secret Lab" building is complete, but progress is slow in moving the various tools, robots, furniture and fixtures out of the storage trailer and into the shop. The unrelenting snow and ice last winter, and the continued delay of actual spring weather has prevented us from getting back into the robot building business. As a result, Team Toad will be taking a year off from competitive robotics. Instead, we'll be focusing our creative and constructive efforts on our plan to attend Burning Man over Labor Day Weekend. We do note with pride that both the NERC and the RSA have held successful robot fighting competitions using arenas donated by the Robot Club. We completed construction and testing of our newest lightweight, HalfPipe, and started packing the truck. We leave for Minnesota Thursday morning. Team Toad is headed to the Nationals in Minnesota. Our middleweight Lionheart and our newest robot, our lightweight HalfPipe are both entered. 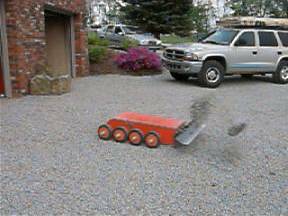 HalfPipe is a new robot built to replace SnowFlake, which is a licensed BattleBot.